Special Containment Procedures: SCP-4546 instances are to be contained in a standard Safe-class locker. Provisional Area-4546 has been constructed around SCP-4546-1; access to civilians is to be denied under the guise of a firework manufacturing facility. Additional test launches of SCP-4546 are suspended indefinitely. With the exception of Researcher Cardenas, no personnel within 200m of SCP-4546-1 are to comment aloud about the anomaly. Description: SCP-4546 is the group designation for a box of individual aerial shell fireworks. SCP-4546 instances constantly emit a quiet crackling sound, with no discernible pattern. Approximately 67% of people within audible range of these sounds will report hearing indistinct laughter (described as "child-like") within the noise. SCP-4546 instances also iridesce brightly when people approach within 3.5m of them. SCP-4546 instances are each 0.8 m in length, and are decorated with red, white, and blue, in the pattern of the United States flag, and bear a label reading "Forever Free". SCP-4546 are composed entirely of nonanomalous chemicals typical of commercial fireworks. Addendum 4546-01: On 02/01/1966, a test firing of SCP-4546 was approved in a remote location. One instance, designated SCP-4546-1, was selected at random, loaded into a mortar, and launched. The selected instance crackled louder and iridesced more intensely prior to being launched. SCP-4546-1 ascended to a height of 119 meters and detonated, producing a burst of red, white, and blue stars, with significantly less smoke than nonanomalous fireworks. SCP-4546-1 remained stationary at its peak height. 20 seconds after the stars faded completely, SCP-4546-1 began to detonate continuously, forming changing shapes and patterns of stars in all colors. As of this writing, SCP-4546-1 has not ceased. SCP-4546-1's bursts and colors possess few consistent patterns. 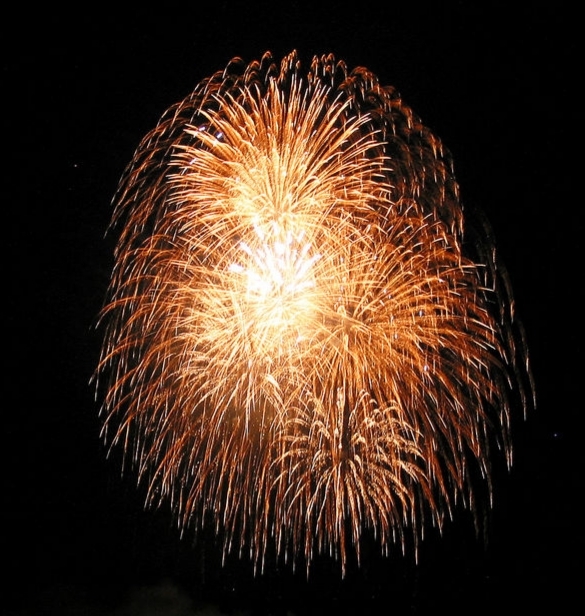 SCP-4546-1 produces larger and brighter detonations on certain holidays; namely, July 4, Memorial Day, and Veteran's Day. On 07/04/1976 (the bicentennial of the United States of America), SCP-4546-1 produced bursts nearly five times their usual size, and created shapes strongly resembling a smiling face. Addendum 4546-02: On 01/22/2017, Researcher Cardenas was assigned to collect routine spectrographic data directly from SCP-4546-1. During the task, Researcher Cardenas audibly commented positively about the beauty of the display, causing SCP-4546-1's burst to change colors to red and display heart shapes in addition to the usual rings and spheres. These altered bursts reappear only when Researcher Cardenas is in SCP-4546-1's vicinity.